The Emirati website of Al-Bayan published a lengthy report about actress Raqia Ibrahim, who was known by her Jewish name Rachel Abraham Levi. The actress was born to a Jewish family on 22 June 1919 in Cairo’s famous alley called Haret al-Yahoud. She started her career selling clothes, sewing for princes and kings, which peaked her desire for fame. Ibrahim’s birth in Egypt did not prevent her being loyal to Israel, the report said, as she encouraged the Jews in Egypt to immigrate to Israel after 1948 war when the Israeli state was first established. The website reported her life since finishing her high school. 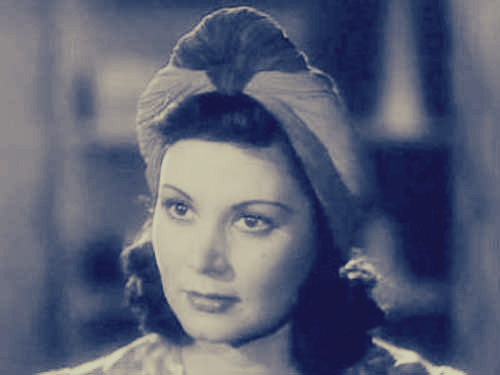 She worked with artistic groups, starting with the Egyptian national group, then moved to Zaki Tulaimat group when her made her first film “The victims” with actor Zaki Rostom. Despite her marriage with an engineer named Mostafa Wali, the report said, her loyalty was against Egypt and the Arabs for the sake of Israel. The report argued her political stance was clear according to the roles she played. Ibrahim once rejected to play the role of a Bedouin who serves the Egyptian army, who was fighting in the Palestine war. She also refused to head the Egyptian delegation in Cannes Festival for being Jewish, which caused her colleagues to avoid her. Ibrahim left Egypt in 1954 to the United States after separating from her husband. Accusations were levelled against her over involvement in assassination of Egyptian Scientist Samira Moussa in 1952. Despite rumors over cooperation with the Israeli Mossad to assassinate Mousa, who rejected an offer to receive US citizenship in return for working at US scientific centers, reporters first spoke to Ibrahim's granddaughters in 2012, who supplied further evidence to support the accusation. According to Al-Bayan, Rita David Thomas, the granddaughter of Ibrahim’s Jewish-American husband who she married upon immigration to the United States, said her grandmother had good relations with Moussa and attributed this to her diaries, which was found two years ago among old books kept in her house in California. Thomas said her grandmother contributed to killing of Moussa through their friendship, which provided her access to her house and allowed her to distract Moussa. Israel was concerned about Moussa’s aspirations as she sought to allow Egypt to obtain the nuclear bomb, manufacturing it at low costs. Ibrahim offered Moussa a deal to receive US citizenship, live in the states and work there. However, the Egyptian scientist refused and expelled her from her house. Ibrahim reacted by threatening her that rejecting the offer would have dire consequences. Moussa did not pay attention to her threats and resumed her research, which made the Mossad unsatisfied and kill her. The website reported that Ibrahim knew about one of Moussa’s visits to a nuclear reactor in the US. She notified the Mossad, which killed her on 15 August 1952. Ibrahim stayed at the United States, where she worked in trade. She also served as a goodwill ambassador to Israel. She passed away on 13 December 1978.